Hi everyone! I think today’s post is a first for me – I don’t think I’ve ever had a Cover Girl nail polish on the blog before. Kind of exciting, I guess? haha! Today I’ll be showing you Violet Flicker and Seared Bronze, two polishes I picked up on clearance awhile back. 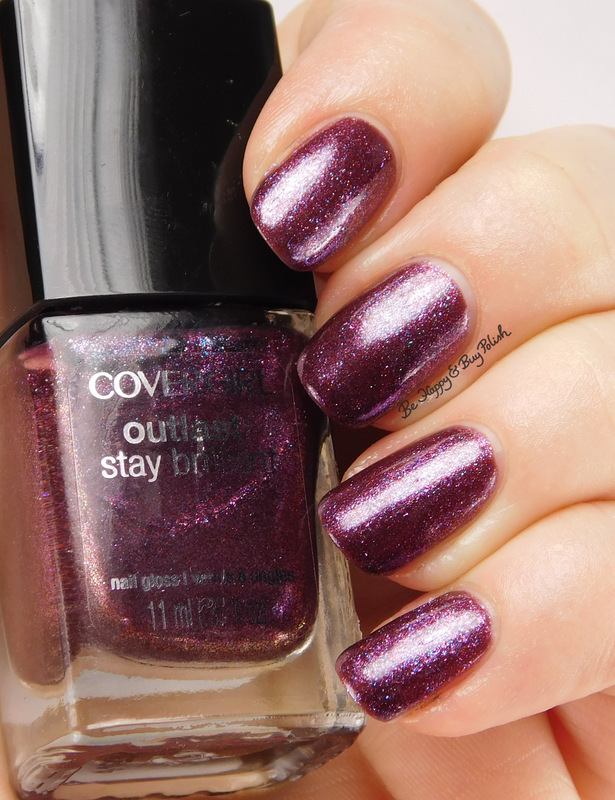 Violet Flicker is a warm purple base polish with sparkles of red, light purple, and blue. Formula on this is really thin, almost watery. Plus it pulled away from the tips of my nails. This is 3 thin coats and no top coat. Seared Bronze is a gold base with sparkles of red, and bronze. Formula on this is the same as Violet Flicker: thin and pulled away from my tips. This is 3 thin coats and no top coat. I should add that both of these polishes left sparkles all over my nails on removal. Such a pain! So, I kind of feel bad that my first impressions of a Cover Girl nail product were not good. Cover Girl was really my first entry into beauty and makeup when I was a teen, so I was really hoping for a solid entry here. What was your first makeup brand when you were a teen? Both colors are pretty! 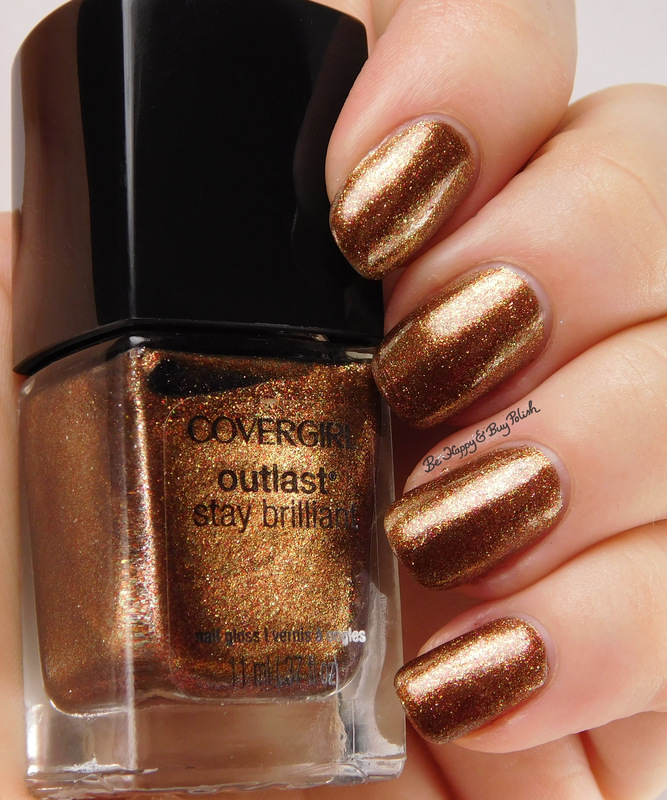 I haven’t tried any polishes from Covergirl but seeing these, I want to now. I bought these but haven’t tried them yet. They seemed pretty interesting for drugstore polishes. Too bad about the formula! That’s what I was thinking when I picked them up, for drugstore polishes they are fairly cool looking! I think I have a few Covergirls in my collection from the Mockingjay collection they did a while back, haven’t worn them yet. I think they discontinued this line recently, I don’t see it getting a lot of nail blogger love. My first makeup as a teen was Maybelline, I had this awesome brown lipstick they discontinued and Great Lash! Lol it was the 90s after all. It’s interesting you had such a poor experience. I bought six from this Hunger Games collection on clearance recently as well. I *just* blogged about the yellow Sulfur Blaze. It was amaze-balls. But I haven’t used the others yet. The sparkles look pretty though, too bad they were a plain.